SKY MAP: The winter constellations as seen at 9:30 p.m. this week from mid-northern latitudes. Who among us fail to notice the beautiful holiday decorations that are in full view at this time of the year? Streets, homes and stores are festooned in evergreens and arrayed in bright lights. As a kid growing up in The Bronx, I can vividly remember one particular house in our neighborhood, which every year was transformed into a twinkling winter wonderland featuring dozens of dazzling festive displays. This included a giant Christmas tree spangled seemingly with thousands of multicolored bulbs. The entire front lawn was transformed into a veritable galaxy of lights. So spectacular was this display that people would come from miles around just to see what became known simply as "The House." Yet, whenever I passed by this scene, I looked not so much at "The House", as I did at some of the other homes that immediately flanked it on either side. I always felt kind of sorry because, while they were adorned with their own pretty holiday decorations, none could match the head-turning array provided by "The House." My childhood memory can also serve as the perfect analogy for the current evening sky, since at this festive time of year, nature too seems to decorate the sky with bright stars. And to be sure, if there is one constellation that could serve as the celestial version of "The House," it's Orion, the Mighty Hunter. Indeed, everyone's attention is always immediately drawn to Orion with its retinue of bright stars, its famous three-star belt and Great Gaseous Nebula, known to be a stellar incubator for new stars. 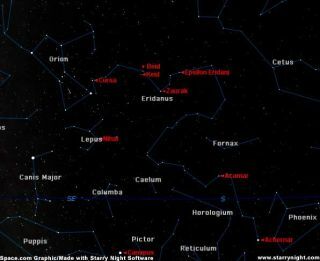 Located due south at around 9:30 p.m. this week is one of the sky's long, winding constellations, Eridanus, the River, which is actually fun to trace out. Begin at Orion, where the star Cursa is located to the north and west of Orion. After passing two stars to the west note the close pair of stars, which have the catchy names Beid and Keid. They are derived from the Arabic words for egg and eggshell, respectively. At Zaurak begins a reverse curve, then four stars extend directly to the west. Among these is Epsilon Eridani, one of our closest stellar neighbors at a mere 10.7 light years away. Back in 1960 it was selected to be monitored by Project Ozma, a radio telescope hat was directed toward it on the infinitesimal chance that it might posses a planet with a civilization advanced enough to transmit radio signals. To the ancients, the River ended at Acamar, but in reality, it is the bluish first magnitude star Achernar that glows at the end of the river. It's the ninth brightest star in the sky, yet positioned so far south that only those who live near and along the Gulf Coast get a glimpse of it, poking a short distance above the horizon. Just to the south of Orion is a group of faint stars that seem to be arranged in the shape of a bow tie: Lepus, the Hare. A number of early peoples associated the Hare with the Moon. However, to the Arabs, the four brightest stars of Lepus, arranged in a crude rectangle, represented four Camels quenching their thirst. According to star-name expert George A. Davis Jr., one of these stars, Nihal, means just that. Lepus's brightest star is called Arneb, a double star whose components are about 3rd and 11th magnitude.
" . . . resembling a blood drop on the background of the sky." Below Lepus, we find Columbia, a star pattern not among the original 48 constellations usually attributed to the ancients. Its origin is uncertain, but in most of the older star atlases it appears as a full-blown dove holding an olive branch in its beak. Columba represents the dove that Noah sent forth after the flood to search for land, hence its original Latin name "Columba Noachii." The Dove flies below Lepus, the Hare and within its boundaries is the place from which the Sun is moving, the "antapex of the Sun's way." In 1718, Sir Edmond Halley determined that the stars were not "fixed," but moved across the sky in what we call their proper motion. In our winter sky, the Sun's path in space is taking us away from Columba at about 12.5 miles per second with respect to other nearby stars. Jason's barge . . . Or Noah's ark? It may also be possible to pick out a few of the northern stars of the now-defunct constellation Argo Navis. In mythology this was the ship used by Jason in his quest for the Golden Fleece. This very large star group lies mostly below our southern horizon, but a few of the ship's higher structures jut up above our southern horizon. In fact, the second brightest star in the sky, Canopus, is located in the Ship's Keel and can be seen from the central and southern United States.